Walter Zielke Reusch, also known as 'Zoohky', made a name for himself as a helpful and friendly person in the West End of Winnipeg. He was known for repairing things that had been broken and thrown away, like bicycles, stereos, and toys. Once repaired, he donated the items to families who needed them. In addition to helping people, he also took care of many stray cats. Zoohky's bike was an important part of his life, he was never seen without it (regardless of the weather). Zoohky died in 2002 at the age of 73 years of a heart attack. His image adorns the former Winnserv Bingo Hall, which has since been renamed Zoohky Memorial Hall. Originally, only Zoohky was shown, but on the advice of the residents was still the inevitable bike to do so. 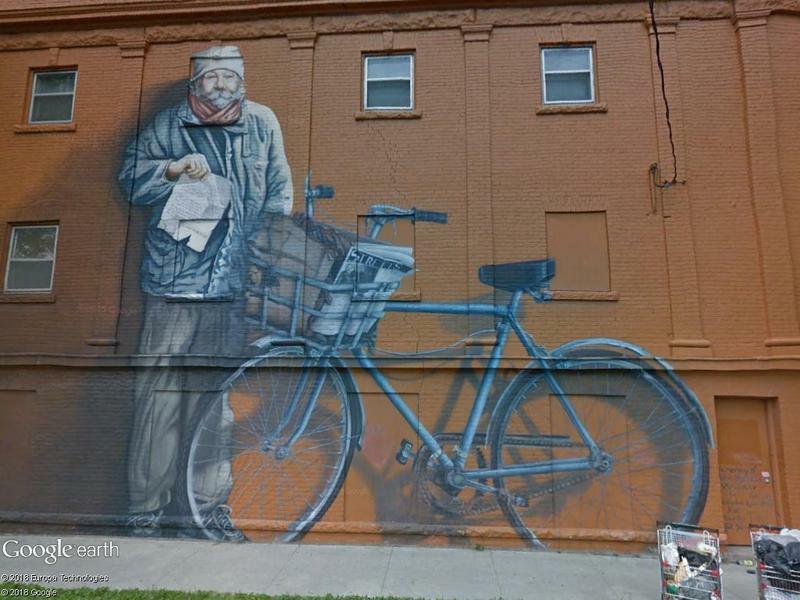 The paper in Zoohky's hand in the mural is an original poem he wrote, titled 'Blue Danube'. After a change of ownership of the building, new windows were installed and the painting was virtually destroyed. After protests, the windows were redesigned as before.